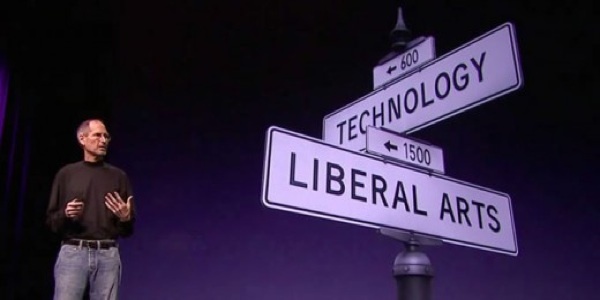 The reason that Apple is able to create products like the iPad is because we’ve always tried to be at the intersection of technology and the liberal arts. To be able to get the best of both. To make extremely advanced products from a technology point of view, but also have them be intuitive easy-to-use, fun-to-use, so that they really fit the users. The users don’t have to come to them, they come to the user. And it’s the combination of these two things that I think has let us make the kind of creative products like the iPad. So, I’ve said this before, but I thought it was worth repeating. It’s in Apple’s DNA that technology alone is not enough. That it’s technology married with liberal arts, married with the humanities that yields us the result that makes our hearts sing. And, no where is that more true than in these post-PC devices. And a lot of folks in this tablet market are rushing in and they’re looking at this as the next PC. The hardware and the software are done by different companies, and they’re talking about speeds and feeds just like they did with PCs. And our experience and every bone in our body says that that is not the right approach to this. That these are post PC devices that need to be even easier to use than a PC. They need to be even more intuitive than a PC. And where the software and hardware and the applications need to intertwine in an even more seamless way than they do on a PC. And we think we’re on the right track with this. We think we have the right architecture not just in silicon but in the organization to build these kinds of products. And so I think we stand a pretty good chance at being pretty competitive in this market, and I hope that what you’ve seen today gives you a pretty good feel for that. The effect could not have been more different. Jobs second speech – like the second iPad, and like the entire presentation that preceded it – was fuller, more filled out. Apple had launched the iPad in 2010 not quite sure of its place in the universe, but a year later, the vision was clear: it was not that the iPad needed to be better at jobs done by a laptop or smartphone, as Jobs promised in 2010; rather, the iPad was capable of previously unimagined applications that were truly life-changing. To put it another way, the iPad 1 launch featured Pages, a pale imitation of a PC word processor; the iPad 2 launch featured GarageBand, an application that was immensely better on the iPad by virtue of it not being a PC. Yesterday’s opening, however, gave the opposite impression: of staleness, and ossification.1 Words and illustrations on a canvas, literally replayed, without life, without originality. Perhaps it’s because it was a video instead of the spoken word, but the rest of the presentation was in the same vein. In Jobs’ words, Cook and company were “talking about speeds and feeds just like they did with PCs,” with hardly even a mention of real people, and the very real impact the iPad had already had on so many, and could have on so many more. Forstall is, more than anyone on the planet – including Jobs – responsible for the iPhone (for this reason alone I found the potshots taken at Forstall, particularly by Craig Federighi, to be in poor taste). He is an incredible engineer – legend has it he could write, or rewrite, nearly any part of the iOS source code on command, and would routinely do so to win disputes in managerial meetings – and a NEXT man, and the closest thing to a Steve Jobs 2.0. Yet Cook fired him anyway. Today, my certainty in this declaration is wavering. What is design? How fast does ossification arrive? Why is it that Jony Ive is the sole arbiter? And what about Forstall? Ive opened and closed the 7 minute and 48 second video, but his total time on screen was only 70 seconds – 15%. Forstall, on the other hand, featured for a straight 3 minutes and 45 seconds – just about half. The face of the product is pretty much defined by a single piece of multi-touch glass. And that’s it. There’s no pointing device. There’s isn’t even a single orientation. There’s no up, there’s no down. There’s no right way of holding it. I don’t have to change myself to change the product. It fits me. We looked at the device and we decided, “Let’s redesign it all. Let’s redesign, reimagine, and rebuild every single app from the ground up specifically for the iPad.” And with this large a display we built apps that aren’t just a little bit better than their smaller counterparts. You get apps that are an order of magnitude more powerful. Forstall’s enthusiasm and excitement are absolutely tangible, and, quite frankly, in marked contrast to Ive. And so it goes. Meaning and value always rise up through the stack, and as hardware increasingly melts away, it’s software that differentiates, that requires the utmost in care, and the ethos of the liberal arts. And yet, today it’s Ive who manages that, and iOS 7 is certainly Iveian: it looks beautiful, it demos well, and it absolutely compromises a certain level of intuitiveness and consideration in the pursuit of beauty. I like iOS 7, particularly its palette, but it is less usable. Almost daily I find myself momentarily stumped about how to proceed or backtrack, and the sparseness of many layouts makes options less obvious. The motion is a neat effect, until the 100th time you see it, or unless it makes you sick. It is more beautiful, but it is less intuitive. 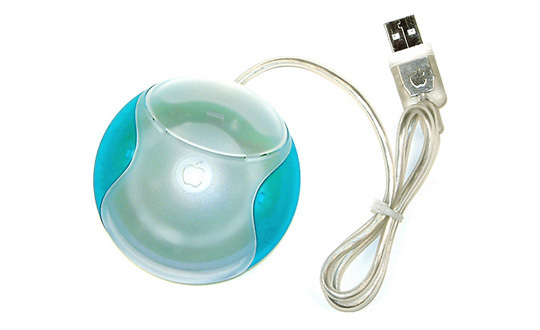 In short, it bears the mark of not just the maker of the iMac, but also the maker of the iMac’s mouse. It’s telling that Jobs did not say that Apple was at the intersection of technology and design. While any designer will tell you that design is about how it works, not looks, to pretend there isn’t a tension is naive. The liberal arts, though, and the humanities, are literally about people. They are about how they learn and experience the world, and each other. The magic of the first iPad – as noted by Ive in that video – was that people already knew how to use it. And the magic of the iPad today is that people are using it in ways no one could have imagined. It’s really an amazing video and each of those scenes has an amazing story behind it. We want to help out customers create even more amazing stories because we know that this is just the beginning for iPad. And so we’ve been busy working on the next generation of iPad. And thus proceeded the speeds and feeds, and none of the actual stories. How has the iPad changed lives? Why does it exist? Where are the apps that makes these applications possible?